Young Gifted and Black was born in 1981 in Ithaca, NY. The aim was to combat the intentional way Black children were left without any knowledge of Black History. YGB's goal was to preserve that history by teaching it to a generation of children. None of what we are doing at Young Gifted and Black is new. It is a reclamation of what has proven to work; preparing the next generation for the struggles they will face in the future. Operating ahead of her time YGB was founded by a trio of public school teachers, Laroilyn H Davis, Denise Lee, and Brenda Byron. As a child Mrs. Davis was taught my Mrs. Mary McCleod Bethune, African American icon, and founder of Bethune Cookman College. Her experience as an educator of over 50 years and her extensive understanding of African American music and poetry played a central role in preparing her to develop YGB. With the support of her son and founding member of YGB Hodari Davis, and Associate Artistic Director Candice Davis, Young Gifted and Black continues its work serving over 50 Black youth from 30 schools around the Bay Area. 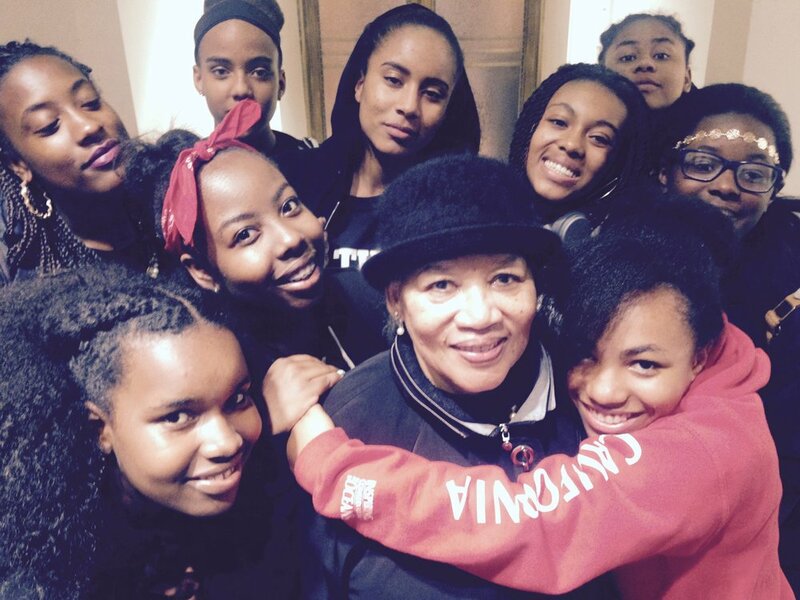 TEACHES BLACK HISTORY THROUGH HISTORIC POETRY, CONTEMPORARY RAP AND LIBERATION SONGS. WE ARM THE NEXT GENERATION WITH THE WORDS FROM THEIR PAST TO HELP THEM FORGE A MORE GLORIOUS FUTURE. Young Gifted and Black makes biannual international trips to affirm the importance of learning Black history and spreading our message around the world. YGB takes these trips as experiential learning opportunities for the participants and for engagement and diplomatic opportunities for the organization. We are spreading the word of of YGB as method to affirm our history and pride for future generations. We align ourselves with organizations that are seeing African Unity through the lens of Pan Africanism, and believe our contribution to the world community is reflective of the commitments and partnerships we serve at home. We are Missionary in our intention to affirm Black pride among African people no matter where they are in the world. Our work is part of a broader mission to stand as proud representatives of our own unique history in the United States while also asserting our role as global citizens and descendants of our ancestors. Young Gifted and Black has been performing in the Bay Area for the thousands of audience members in and around the Bay Area. Over the past 5 years, YGB has averaged over 50 shows per year, including performances for audiences as large as 3000, and as small as 30. We have also been building curriculum guides, handbooks, and implementation programs to help in the replication and deployment of the model around the United States. We are actively pursuing collaborations with African American Achievement programs, locally and Nationally to establish chapters of Young Gifted and Black around the country. We are currently available to provide technical assistance for organizations interested in the model, and to do public speaking on the importance of pride education and African American History both with and without our performance ensembles.